Just a recommended stream if you like to watch poor Banished people struggling in the North under the toughest conditions. Pure Nordic game on large mountain maps in harsh climate. The Viking Turf Houses from work in progress are now available as a separated preview mod. Main use of this new house type is in early game or in situations where wood is rare. A new and specialized storehouse from Finland with a passageway and lots of space for clothes, tools and utensils. Single mod and ready for download. A new model is just finished, out of the row but filling a gap in the current North mod. The vanilla hospital can now be replaced by this new building from Finland. Check out the new work in progress for Banished such as flax production, specialized and bigger storehouses as well as a reworked trading post to remove the last vanilla flavor. A new Banished veteran is venturing north. Let’s play with Athena Artiste and a nice bunch of additional mods from Kid, Embx, RedKetchup and Discrepancy. End of September and time for some more news about the current work in progress, such as wooden idols and a pagan temple for the old gods. And some downloads of finished items. Version 7 of the North mod is in progress. 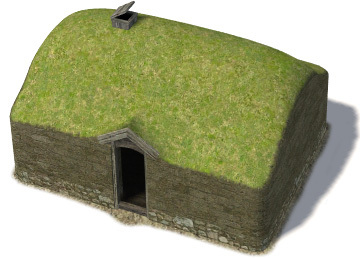 See what new models were made in the last weeks, like Viking turf houses, frame houses and more. How the happiness system works in Banished and how to make your people fully happy in the North since the latest mod updates.